Your journey in Yogyakarta will be incomplete unless you feel the sensation of Progo rapids. Not only beautiful scenery we can enjoyed but the river is very challenging to overcome. Located just 20 minutes from Borobudur Temple and 45 minutes from Yogyakarta, rafting in the Lower Progo river is an option which easily accessible . Progo river rafting with oars boat styles organized by TOP Rafting Oars Orogo. Equipped with international standard equipments, professional river guides and OARS technology, will make you possible to run large river like Progo which have almost the same like Colorado or the Zambezi river. With the exotic location, Progo river rafting offers a challenge white water rafting activity grade 3 - 5. Along the way you will enjoyed beautiful panorama while your adrenalin rushes in fast in rafting along the river. Surely, rafting at Lower Progo river will give you a sensational experience. Waterfalls decorated with a rainbow, the slopes of legendary Mt. Merapi and Mt. Menoreh will coloring the panoramic while drifting along the river for 2 - 2.5 hours trip. The trip starts below 'Ancol dam' and finishes at Kreo bridge (TOP Rafting basecamp). In the middle of the trip, participants will take a short break and have their snack, served with fresh coconut water / soft drinks which will give them more energy to get back in the rafting game. If you wanna try new experience Rafting in a moments when the sun would appear from the horizon, Sunrise Rafting package should be in your adventure list. Gain experience sunrise river rafting with maneuvering oar rafts, ideal for extreme adrenaline rush and a local breakfast on the river bank will become the most memorable adventure trip. 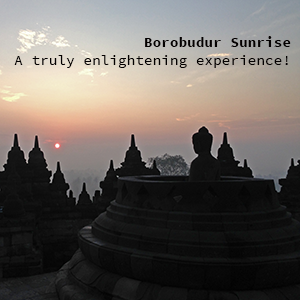 After 2.5 hours of challenging and joyful rafting journey along the Lower Progo river, participants still get their chances to visit one of the famous seven wonder in the world, Borobudur temple. It is easy to get there because its location only 20 minutes from the finish point.